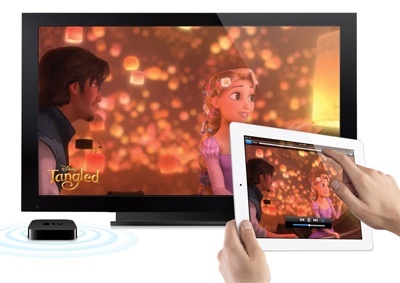 Apple Television Set to Include Siri and Face-Tracking iSight for FaceTime Calls? 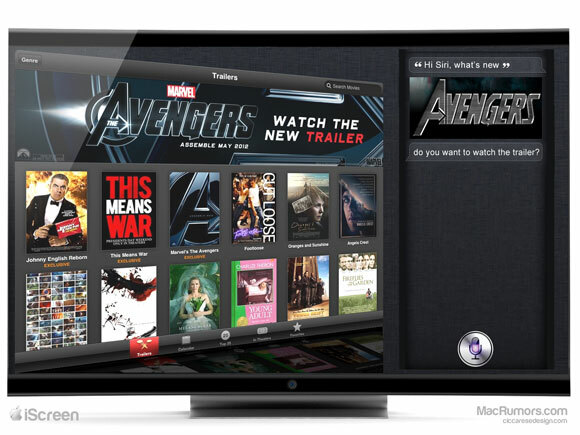 Apple Television Set to Include Siri and Face-Tracking iSight for FaceTime Calls? : “Cult of Mac reports that it has received information from a ‘well-placed’ source who claims to have seen a prototype of the rumored Apple television set. According to the source, the device resembles Apple’s current Thunderbolt display but is ‘much larger’ than the 27-inch model currently offered. Among the key features reportedly included on the prototype Apple television set is a Siri-enabled iSight camera allowing users to make FaceTime video calls using the device. Addressing the fact that users are likely to sit substantially farther away from the television than they do their computers and mobile devices, the source claims that the camera will be able to automatically detect and track faces, zooming in on them for FaceTime calls even if they move about the room. The Apple HDTV makes FaceTime calls using the built-in iSight camera. The camera is sophisticated, with facial recognition and the ability to zoom into the user’s face and follow them as they walk around the room. This allows users to make video calls from the couch across the room, rather than having to stand smack in front of the TV. In addition, calls are initiated by Siri, the iPhone 4S’s virtual assistant. ‘[Apple] used Siri to make a FaceTime call,’ the source said. Apple’s rumored television set is widely expected to make extensive use of Siri, a rumor that first surfaced in Jobs’ authorized biography, in which he was quoted as saying that he had ‘finally cracked’ the problem of creating an elegant interface for the device. With Jobs calling it ‘the simplest user interface you could imagine’, speculation immediately leapt to Siri, which could allow users to change channels and find shows using only their voice. The idea of a Siri-enabled television set quickly gained steam with a followup rumor from The New York Times claiming that Apple was indeed working on such a device for a launch in late 2012 or 2013. Apple has reportedly been working with component suppliers on plans for Apple television sets in recent months, although debate continues as to whether such a product will be ready for launch by late this year, next year, or even 2014. Tech of the Hub notes (via Wired) that the new upgrades to the iTunes in the Cloud services to include movies purchased from the iTunes Store have another benefit: matching of iTunes Digital Copies that are sometimes included with the purchase of films on DVD or Blu-ray. I purchased the 2009 release of Star Trek on Blu-ray which came with a digital copy on an additional physical disc. A while ago, I loaded that digital copy on my iMac. […] I can now stream the movie directly from Apple’s cloud. Star Trek shows up under my purchased titles and the iCloud icon appears with it. The feature is of course limited to those films which are currently available through the iTunes Store, but for those that are it provides a convenient way to access bundled digital copies from any iCloud-connected Apple device. The main persistent weakness/problem with the new 1080p AppleTV (3?) = no USB port that allows access to external storage of movies – WHY?!? I purchased the first small black square AppleTV (2?) and resold it because it does NOT support attaching an external hard drive, and directly playing movies that you have created in iMovie (with your iPhone or iPad or another camera), and/or legally recorded from commercial television (I use an EyeTV HD device for this). The newest version is no different, besides a different GUI, faster processor, and finally supporting 1080p it is exactly the same animal. Why does Apple assume that you do not want to play locally stored movies? Why must all of the movies be accessed from the cloud or by streaming them wirelessly or by ethernet from your Mac/iTunes to your AppleTV? Yes, iPad and iPhone mirroring on your big screen is tempting, but why must all of the video be downloaded and at least cached on the AppleTV, before it is played? Bandwidth hog anyone? Micro-USB (for service and support) – how about for attaching an external hard drive? How hard would this be? This (above) is all she wrote – really now, how hard would it be for Apple to add a USB port to the list? Until Apple addresses this I will have to live with the limitations of a Boxee Box, and hope that someday, somehow Boxee will allow easy creation and use of video playlists – another completely mindless omission. It may look exactly the same as its previous generation, but some oomph has been added. Per Macworld, Apple unveiled a new Apple TV model on Wednesday, with support for 1080p video and a new user interface, at a special event in San Francisco. The new Apple TV model features a redesigned user interface with iOS-like buttons that appear on the home screen below the thumbnail images. The buttons highlight Apple’s movies, TV shows, music, computers, trailers, podcasts, and settings areas, but also better call out the third-party services available on the Apple TV, including Netflix, Vimeo, and live sports subscriptions for baseball, basketball, and hockey. Still, the good news for current Apple TV owners is that the new interface is available Wednesday as a free software update. The company also added support for 1080p HD video with the new model. Previously, the Apple TV only supported 720p HD video, and that’s the highest resolution that Apple sold through the iTunes Store. Now the Apple TV can play 1080p video, and movies and TV shows sold by Apple will now be available in 1080p resolution as well. Users can redownload movies you purchased on any of your devices. Movies and TV shows in the iTunes Store will now support 1080p HD. The higher resolution means better-looking photos too. Apple has allowed you to redownload (or stream to the Apple TV) TV shows you’ve purchased already. The company has now added movies to the list of content you can redownload as well. The Apple TV also incorporates Apple’s Genius functionality in order to recommend movies based on your downloading habits. The new Apple TV looks identical to the previous model, but incorporates a more-powerful single-core A5 chip instead of Apple’s older A4 chip from the second-generation Apple TV. The new model will be available on March 16 at the same US$99 price as before. Nailing the rumored introduction date on the head, Apple has begun to issue media invitations for an iPad-themed media event which will be held on March 7th at 1:00PM Eastern at the Yerba Buena Center for the Arts in San Francisco. The tagline of the invitation simply reads “We have something you really have to see. And touch.” Of course, this event is believed to be the launching point for the next-generation iPad, which is expected to sport a quad-core processor, retina display, and a slightly altered design. Tune in to iSource on March 7th for up-to-date coverage and opinion on the announcement. Part Numbers Suggest Imminent Availability of iPad 3 and New Apple TV: “9to5Mac reports that reliable source Mr. X has revealed part numbers for at least some models of the iPad 3 as well as an updated Apple TV set-top box. According to the report, Apple is releasing three different variants of the new iPad, going by code names J1, J2, and J2a, with the presumption being that J1 corresponds to a Wi-Fi only model while the J2 variants correspond to models with cellular data capabilities. The part numbers also include reference to the J33 product that had previously been identified as a new Apple TV. 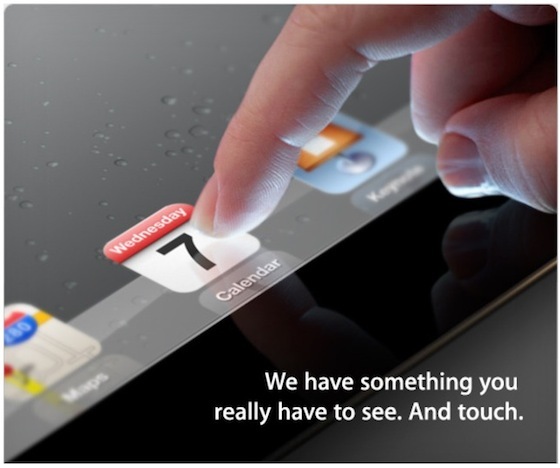 The report indicates that iPad 3 shipments are indeed already making their way around the world in advance of the device’s introduction, suggesting that customers should see availability come relatively quickly after the media event. Speculation based on the part numbers suggest that the J1 variant (presumably the Wi-Fi only models) may come in only one color at launch. Part numbers are also showing a mystery “B82” product launching alongside the new iPads and Apple TV. It is unclear what that product is, but is likely to be a new accessory of some sort. Apple is expected to introduce the iPad 3 at a media event rumored for March 7, while we have believed for some time that the upgraded iPad 3 would pave the way for an update to the Apple TV and higher-resolution iTunes Store content. • Apple Co-Founder Ron Wayne on "Why I Left Apple"
This is sort of out of nowhere, but it could lead to something interesting. Per 9to5Mac, an upgraded Apple TV media hub might come sooner than thought after signs emerged that multiple stores ran low on stock. Amazon, Best Buy, Buy.com, Radio Shack, and Target all show the device either as out of stock or taking weeks to ship. Apple and others do have supply, but it follows a pattern of third-party resellers usually running out first. While it’s possible that there would be a temporary lull in stock, new tips suggest that the existing version may have been phased out. No more were shipping to Best Buy stores, a person at the retailer claimed. Code references have been appearing that refer to a new Apple TV for the past few months, but little has emerged as to what it might be. With a full TV set unlikely in the near future, it’s more probable that any device, if it reaches stores, would be an A5- or A6-based update that could support 1080p video. The timing follows some dwindling iPad 2 stock and raises the possibility that Apple may use an increasingly likely early March event to show both a new Apple TV and a new iPad at the same time. Stay tuned and we’ll have details as soon as they become available. Did store spill beans on Apple TV? Did store spill beans on Apple TV? : “Best Buy wants to know if you&apos;d pay $1,499 for a 42-inch, high-definition Apple TV which uses your iPad or iPhone as a remote control. Apple Sold 1.4M Apple TVs in Most Recent Quarter vs. 2.4M Sold in All of Fiscal 2011: “Apple sold 1.4 million Apple TV set-top boxes in the Q1 2012 quarter, Apple CEO Tim Cook disclosed during today’s earnings call. Cook also disclosed that Apple sold 2.8 million Apple TVs in all of fiscal 2011, so the last quarter’s results seem to represent a significance acceleration of sales for the product. 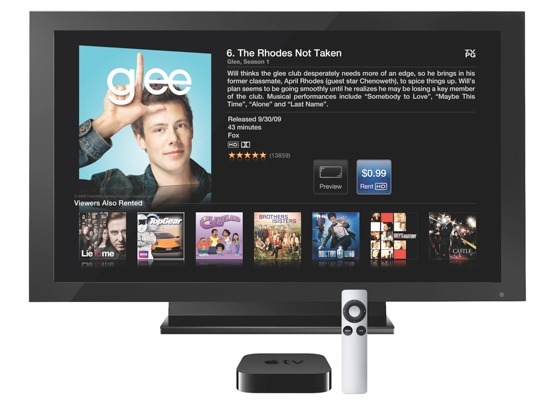 The current generation Apple TV was released at the beginning of fiscal 2011, which means Apple has sold 4.2 million 2nd Generation (iOS-based) Apple TVs in total. This is fairly impressive, especially considering Google’s set-top box efforts have fallen flat thus far. However, even with these numbers, Tim Cook still considers Apple TV a “hobby” simply because on a dollar-for-dollar basis, the device barely makes a dent in Apple’s earnings numbers. We continue to add things to it, and I don’t know about you but I couldn’t live without it. We continue to pull the strings and see where it takes us. In the past year, Apple has added support to Apple TV for the streaming service from Major League Baseball, the National Basketball Association, and the National Hockey League, among others. We’ve previously reported about competitors “scrambling” to identify what an Apple television set might look like. The lead up is reminiscent to the large number of tablet plans from competitors in the months leading up to the original iPad launch.